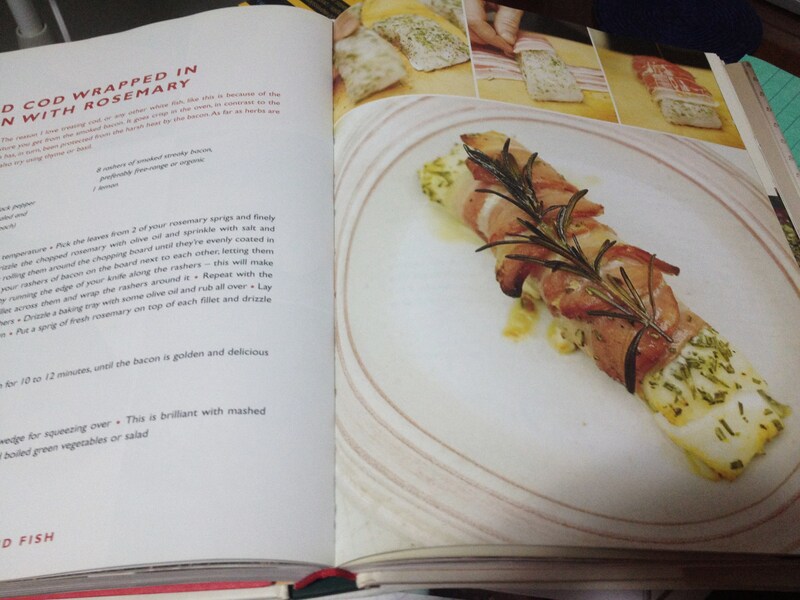 Jamie Oliver’s Baked Cod Wrapped in Bacon! When I left Singapore in 2010 to move to Mexico (to literally move in with this boy I had been having a long distance relationship with for the past year or so), I moved with a suitcase. I sold or gave away most of my furniture and packed down a few boxes of personal possessions that meant something to me and stored them at my parents. This was my exit strategy. The less things I brought with me to Mexico, the easier it would be to pack-up and leave if things did not work out. Luckily for me they worked out perfectly, unluckily for my parents, they where lumbered with these boxes for the last few years. So when I was finally back in Singapore over Christmas, I went through them and come accross all my old cookbooks which I was planning on giving away, but just couldn’t bare to do it – so brought them all back to Brazil with me! So, I have been going through them to get some inspiration and looking for new meals that are LCHF friendly, and when I came across this recipe in one of Jamie Oliver cookbooks ‘Jamie’s Ministry of Food’, I just had to try it. I don’t know why, but I never thought of pairing rosemary with fish, let alone bacon! The outcome was fantastic! The recipe calls for cod fillet with skin on, however it also says that it works well with any other white fish. Embarrassingly I do not know what type of fish I used, all I know it was not cod, and it was white! C had bought them while I was away and popped them into the freezer. He claims it was sea bass, but I feel as though it was red snapper….my point is, even though it wasn’t cod, and even though it didn’t have skin on…it still tasted really good! Preheat your oven to its highest temperature. Season the cod fillets by rolling them around the chopping board until they’re evenly coated in the herbs and seasoning. Lay half your rashers of bacon on the board next to each other, letting them overlap. Place a cod fillet across them, and wrap the rashers around it. Repeat with the second cod fillet and the remaining rashers. Drizzle baking try with some olive oil and rub all over. Lay the cod fillets in the tray, skin down. Put a sprig of fresh rosemary on top of each fillet and drizzle with a little olive oil. Place the baking tray in the preheated oven for 10-12 minutes, until the bacon is golden and the fish is cooked through. I was waiting for the bacon to go that lovely golden brown colour which it never did, so I over cooked the fist as it was in the oven for 15 minutes. In future, after 10-12 mins, if the bacon still needs a touch of colour, I would put it under the broiler for a bit. Next > Savoury Mediterranean Muffins! Looks good. It is alway good to do something even if you really are not quite sure (use a white fish you don’t know, or go off to Mexico…!). Pingback: Baked Cod Wrapped in Bacon! | LCHF...What? AHH Fantatsic! That makes me so happy to hear! I haven’t made that recipe in ages, but you have reminded me how good it is! Your recipe looks a lot better than Jamie Oliver”s !!!!!! I made this last night and put it under the broiler for the whole time. It came out great, but the bacon underneath doesn’t get browned.